New Ford Mondeo: more details | What Car? The new Ford Mondeo revealed at the Detroit motor show 2012 will be sold in sleeker five-door form in Europe. The 2013 Mondeo for Europe will share most panels with the Ford Fusion shown at Detroit, but we'll get a more rakish five-door hatchback and a sleek estate version. At an exclusive event, we saw a sneak preview of the Mondeo hatchback and estate. 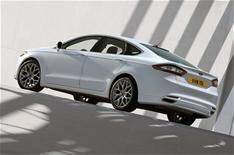 The 2013 Mondeo hatchback will have a more sloping rear windscreen and roofline than the Fusion, and a rear door that stretches further back over the car. The overall look is similar to that of the Audi A5 Sportback. The estate version likely to be launched at the same time as the hatchback has a similar rear end to the current car. A lower overall height gives a more slimline look, but Ford says theres no reduction in luggage or passenger space. European Mondeo models will also have different door mirrors to the US Fusion, because of different safety legislation requirements. European cars will have shorter, deeper mirrors, which will reduce the overall width of the car (including mirrors) to roughly the same dimensions as the current model. The body itself is slightly narrower and longer. Fords designers were keen to point out some of the new Mondeos premium detailing, citing features such as a new, flush-mounted Ford badge and sophisticated light signatures. Theres also an extra glass panel in the front side windows, which is designed to create a lighter, airier cabin and provide a classier glass-to-metal finish, rather than the large black plastic panel thats used on the current car. Interior innovations include new seat structures that free up more rear legroom, a centre console with floating supports and a 20cm colour touch-screen. European Mondeos will use different materials and trim to US Fusion models. Higher-grade plastics for the air vent surrounds and more metallic trim are likely.